Jekyll Island, Georgia beaches include lush landscapes. Photo by Christine Tibbetts, Blended Family Traveling Mom. Leery of familiar hotel brands giving themselves a new name? 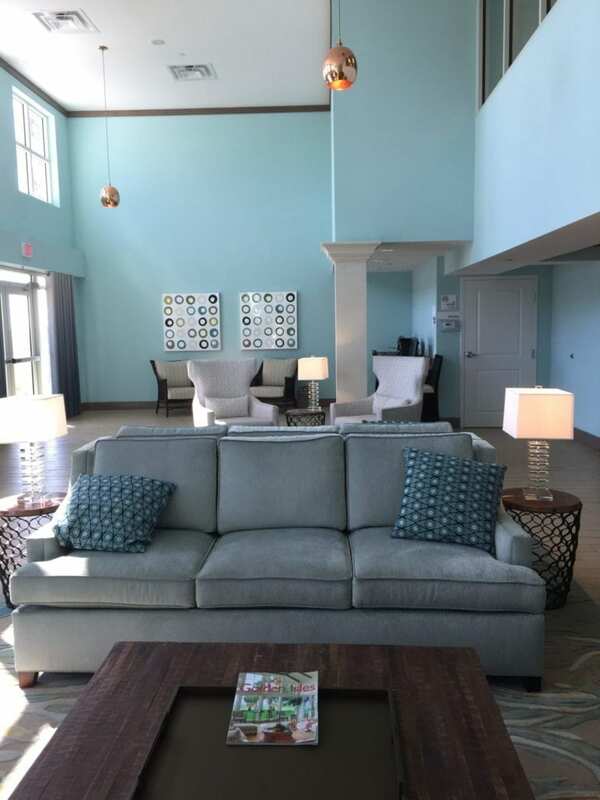 Blended Family Traveling Mom was too when she booked two nights on the Georgia coast in a Holiday Inn Resort opened in March of 2015. Here’s what she found for families heading to this seashore. 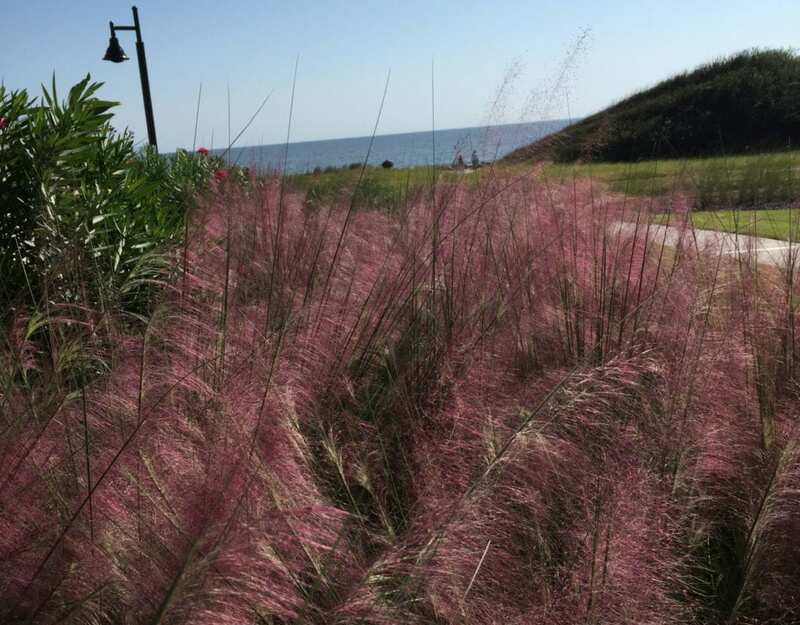 If your family’s brand loyalty takes you to Holiday Inns as you travel, you’re in luck with a trip to Georgia’s barrier island named Jekyll. If that’s not your must-go-to lodging brand, your luck is just as good because this one’s a Holiday Inn Resort, new styling with only 31 so branded worldwide. I traveled with skepticism and was rewarded with a new attitude. Déjà vu greeted us with a feeling of familiar pulling up to the long, stretched-out, two-story building. Holiday Inn-ish for sure. Standard green on the sign. Cars parked in front of their door, or close to stairs to the second floor. Portico indicating doors to lobby. That’s where the changes began. Sleek, modern reception area in shades of pale ocean-blue with art evoking bubbles and sea foam. Colors deviate from Holiday Inn green when the Inn is a Resort. Photo by Christine Tibbetts, Blended Family Traveling Mom. Floor-to-ceiling wall of windows facing east to the Atlantic Ocean. Concierge desks—two of them—inviting check-in comfortably seated, and destination information. Stand-up option too so multiple families can check in simultaneously. If going to your room before the beach is your goal, better keep the kids in the car because the wall of glass pulls everybody outside fast from the reception area. That allure could be the playground with Crayola primary colors defining slides, swings and climbing towers. 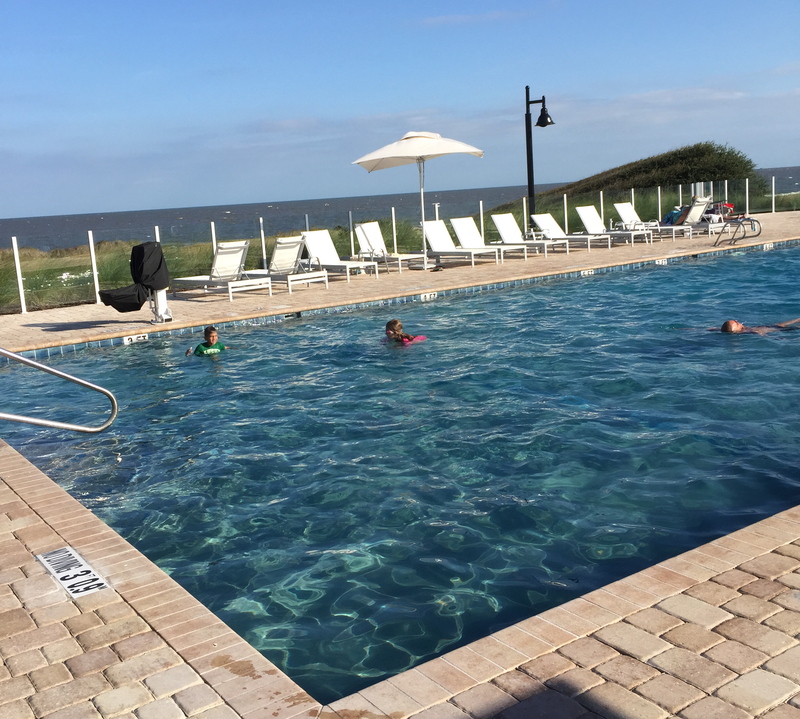 Families can play just out the back door at this Holiday Inn Resort. Photo by Christine Tibbetts, Blended Family Traveling Mom. Or the lawn. Really. 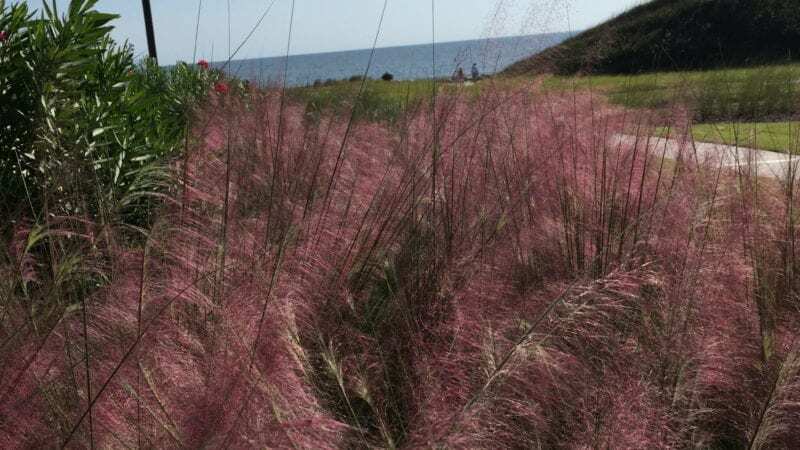 Abundant grass at the beach, inviting coolness for bare feet and soft surfaces for a picnic. Smooth paved bike lanes wind through this Holiday Inn Resort back yard, separate from the lawn, separate from the sand and connected to a system of 25 miles around the Island. Good chance of nabbing an ocean view because only 20 of the 157 rooms don’t face the sea. Might need to book early to get a suite: only 21 of them and all ocean-view. Separate living and sleeping spaces with the suites, some have kitchenettes. 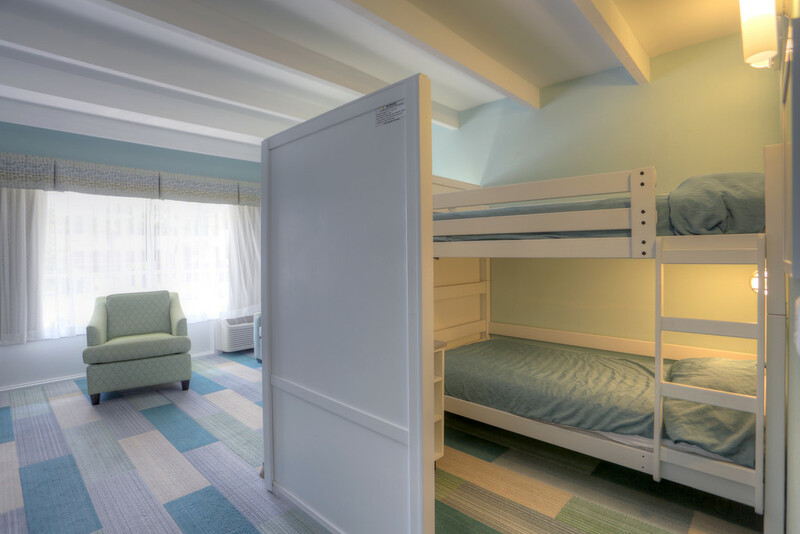 The wall slides shut for bunk bed privacy in the Holiday Inn Resort family suite. Photo courtesy NorthPointe Hospitality Management LLC. Two of the suites have a bunk bed setup in the living area, complete with its own sliding wall to cordon off completely. For the kids that apparently feels like a secret hideaway and for the parents, well, perhaps options for romance. “If we could have imagined how popular those bunk beds would be, we would have built more,” Holiday Inn Resort Marketing Manager Holly White told me, so my advice is book early. Ground breaking in November, 2015 means a full-service restaurant with wrap-around porches by summer of 2016. In the meantime there are two on-site options. One works well in lovely Georgia weather but would be daunting on a cold or rainy day because it’s all al fresco. 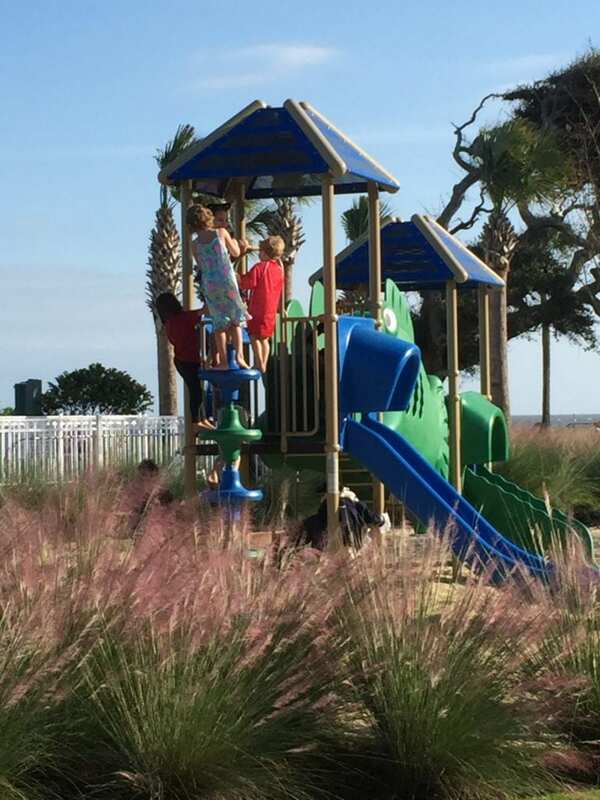 Since the vast majority of Georgia coastal days are pleasant, this means dining by the pool, in view of the lawns, ocean and playground – a short walk from your room. My family shared excellent pizzas the first night: veggie for one, pepperoni and extra cheese the other. Breakfast here included all the standard egg options, frequent coffee refilling, pastries and pancakes. High chairs and booster chairs were missing but might have been added in since my visit. Swimming pools next to oceans always please traveling families. Photo by Christine Tibbetts, Blended Family Traveling Mom. On the third floor crow’s nest of this basically two-story lodging is another dining option, sort of a coffee shop with full bar. Also in this top floor section are the kids’ activities room, guest laundry and fitness center adjoining a cheerful balcony overlooking the lawns and the sea. Lovely spot for a cocktail. Sandwiches are $10—turkey or roast beef and can be grilled. Next door is a large Mexican restaurant with live music many nights, views of the sea, indoor and outdoor seating. Ride your bikes to Beach Village, a boutique shopping and dining commons in development. Solid tip: food is excellent at the Market and Deli to eat in or take out, prepared, ready-to-eat or groceries. Wild Georgia shrimp or barbecue can be ordered at one window, serious meat, cheese, bread sandwiches at another and salad charged by the pound at a spacious chilled bar. If you forgot to pack wine or sunscreen, get it here. Full-service this market. The ocean, pool and playground are right out the back door and almost always in view. A full-time activities director guarantees frequent programming, including rainy day activities in the third-floor kids’ room with window views to the ocean. 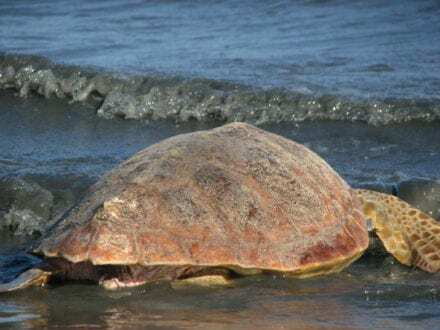 Sure, many beach hotels guide visitors to new understanding of marine life and specifically sea turtles but Jekyll Island has a Sea Turtle Center and a serious mission to rehabilitate hurt turtles and to protect the eggs and guide the babies back to sea. Healing injured turtles for return to the sea is the mission of Jekyll Island’s Sea Tutle Center. Photo by Christine Tibbetts, Blended Family Traveling Mom. Ask at the Jekyll Island Resort front desks to borrow a flashlight with a red cover to mute the light when you walk around at night, and plan ahead not to gripe if the reading lights in your room are dim because that too is part of turtle protection. Hope you get lucky and discover a turtle release back to the sea when you are there; their healing can not be scheduled so this is good fortune if you vacation on a return-to-the-sea day, not event booking. Pay $6 (called a parking fee) when you enter Jekyll Island via a paved causeway, not a towering bridge, with funds directed to conservation and stewardship. The charge card kiosk is easy to use and you’ll see the benefits quickly with canopy roads, ancient water oak trees and dune grasses, plus lush lawns in the Landmark Historic District and residential neighborhoods, similar to the Holiday Inn Resort back yard. Rent bikes from the Jekyll Island Authority for the best price; they’re on Shell Road near the miniature golf course. Simple bikes are $5.56 an hour or $13.78 for the day. Claim one for three days and the fee is $31.8. 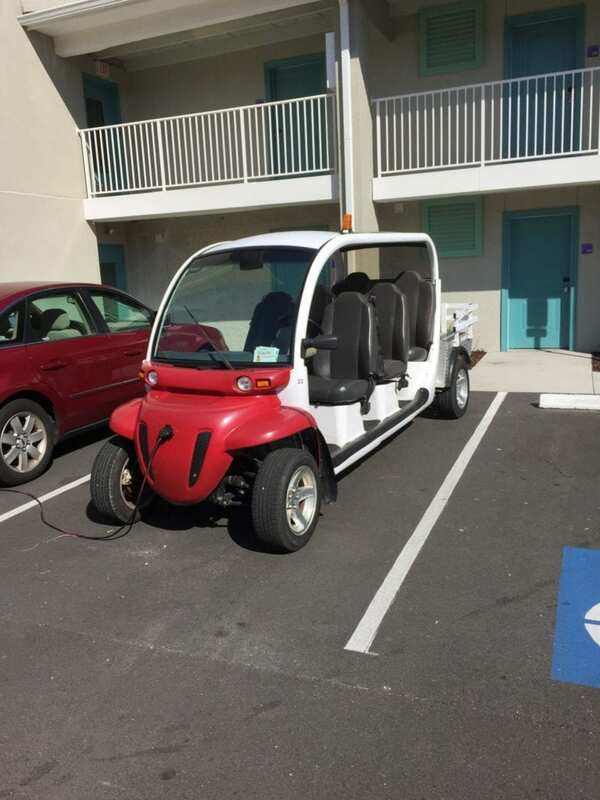 Charge your electric car in front of your Holiday Inn Resort door. Photo by Christine Tibbetts, Blended Family Traveling Mom. Funny open-air electric cars called Red Bugs can be rented too for the hour or up to five days. Since the Island is only seven miles long and 1.5 wide, good chance you can explore it all. Have you stayed on one of Georgia’s barrier islands? Love to hear your experiences.